Isn't it gorgeous? Wouldn't you love waking up in the morning and having a cup of coffee in your yard with this surrounding you? My neighbors don't agree. 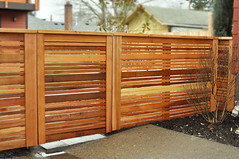 They want a boring old vertical board fence. But more on that later.